As you can probably tell, I want new shoes. I am loving mules at the moment, as well as pointed boots, and flats... And heels. I am also considering jumping on the chunky slider bandwagon, although I have some of Asos' Feodore sliders (these), I don't feel like they are appropriate for general day wear, perfect as a flip flop replacement, but not high quality enough for much else. Not that I am complaining, they were cheap enough! I love the texture and edgy look of these sliders though, they really caught my eye. Chunky knits and roll necks are an Autumn/Winter trend that I definitely want to be involved in, if only because I hate being cold. I really like New Look's offerings, the cropped roll neck looks really Zara-esque and the orange chunky knit is just so bright, I love it. A large rectangular clutch has been on my wish list for a while, ever since seeing someone don the Michael Kors version in Look magazine's street style pages. 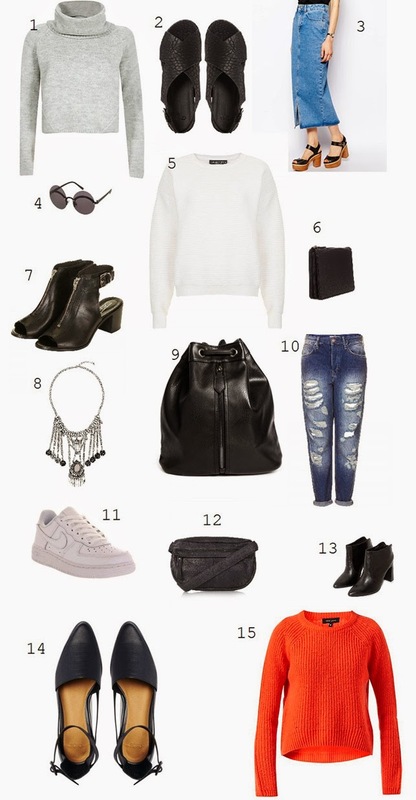 As has a new backpack, I have a nice leather Topshop one that I used for uni but it is a bit too big for normal daywear and I really like the structured and drawstring styles. I also want some trainers, I have for such a ridiculously long time, but I haven't yet been able to justify the expense. Why are they all £70 plus?! Doubt I will be able to afford any of the above, but one can dream! I really like the drawstring backpack! Love all these bits! the Topshop boots are gorgeous, I've been lusting over them for a while! Great selection, love the ASOS bag! I'd like to own it all! That's a really nice selection of pieces, my favourite one is the bright orange jumper! Amazing wish list! I love your style.